Wes Anderson’s Isle of Dogs initially premiered in Berlin on the first day of the Chinese Year of the Dog, but it is clearly an affectionate tribute to Japanese cinema, particularly to the late, legendary Akira Kurosawa and to Hayao Miyazaki, co-founder of Studio Ghibli. Isle of Dogs itself is, unmistakably, a creation in Anderson's own unique style. Lovingly crafted and boasting a wealth of famous voices, it is also peppered with Anderson’s trademark quips and understated, tongue-in-cheek humour. Anderson’s second stop-motion animation after The Fantastic Mr. Fox (2009), Isle of Dogs places us in Japan in the near future, when the population of dog-lovers is persuaded to give up their pets, as a mysteriously virulent outbreak of Dog Flu and Snout Fever apparently threatens to cross species and infect human beings (a reminder of the Asian outbreaks of swine and Avian flu). Mayor Kobayashi of Megasaki City (Kunichi Nomura), whose family has held a grudge against canines spanning many generations, orders the roundup of all dogs. He then exiles them to the garbage-infested Trash Island, where they must fend for themselves or die. This becomes known as the Isle of Dogs. However, six months later, Atari (Koyu Rankin), the 12-year-old orphan and adopted ward of Mayor Kobayashi, disobeys the isolation directive. He flies across the water and crashes a plane onto Trash Island in order to rescue his beloved bodyguard-dog, Spots (Liev Schreiber). A pack of five starving, abandoned dogs, some still clinging to their former lives as beloved pets, attach themselves to Atari as a substitute master. So it happens that Rex (Edward Norton) King (Bob Balaban), Boss (Bill Murray), Duke (Jeff Goldblum), and an unwilling participant, the hard-bitten stray known as Chief (Bryan Cranston), join Atari in his search. The quest leads the little group across the island, where the rumour has it that Spots may be among a reportedly savage pack of feral dogs. During the trek we discover that Trash Island is not only a rubbish dump, but also a graveyard for the fossil-fuel industry and a failed nuclear plant. There is also detritus from natural disasters - Tsunamis and volcanic eruptions - evident in piles of decaying cars and a derelict Fun Fair. While the dogs all speak English, the actors mainly speak Japanese, which is not sub-titled, but left to be translated by Frances McDormand’s energetic character, Interpreter Nelson. 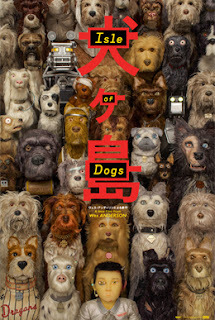 Isle Of Dogs, which took two years to shoot in London’s Three Mills Studios, offers lavish attention to detail and elaborate dioramas. The influence of Kurosawa and Ozu is evident (there’s a decaying statue of Toshiro Mifune on Trash Island). Stop-motion taiko drummers, 19th Century traditional Japanese artwork and sequences from kabuki theatre are integrated into Anderson’s futuristic Japanese landscape, while the character of Atari references anime. Apart from its storytelling and visual pleasures, what makes Isle of Dogs interesting is its subtext and themes. Ostensibly it is a humorous and lively story about loyalty and tolerance, but it also examines unethical and manipulative leaders inciting fear in the population in order to serve their own prejudices and personal gain. In Megasaki City, a corrupt Mayor has come to power via rigged elections. He is then free to surround himself with his cronies and to disseminate ‘fake news’ via a propaganda TV channel. Isle of Dogs may be enjoyed as delightful light entertainment, but if one wants to look further, the film is also about fear of the different, the foreign, the ‘other’ – except that in this case ‘the other’ happens to be canines. Whipped into suspicion and panic, the humans are willing to let the dogs be rounded up, impounded, and imprisoned on an isolated island at a distance from their town. Cowed by the exhortations of their leaders, the humans then agree to build barbed wire fences and create internment camps, and finally to send drones to exterminate the ‘canine threat’. Ultimately, as so often in history, it takes a group of angry young students, led by cub college reporter and exchange student Tracy Walker (Greta Gerwin), to tenaciously uncover and expose the truth. The underlying question we may be left with is; how might a population be manipulated by self-serving leaders into demonizing fellow human beings, who would themselves never tolerate even their own animals to be treated with similar disdain, disregard or downright malice?